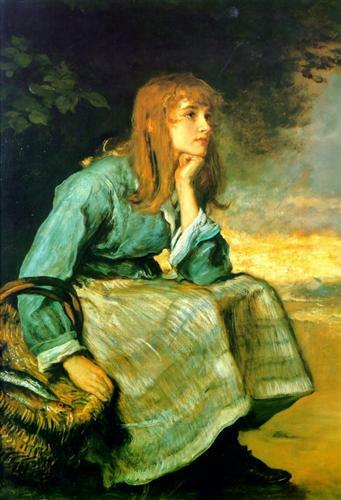 I am indeed grateful to Millais junior for the above account as it gave me lots to go on in finding Miss Buckstone. Actually J. B. Buckstone was her father, although you'd be forgiven as Mr Buckstone had been married twice and Beatrice was one of the many children of his second marriage. Mr Buckstone was born in 1802 and went on the stage at 18, performing at the Surrey Theatre in 1823 and writing his first play in 1826. All in all he wrote more than 150 comedies and farces and managed the Haymarket Theatre from 1853 to 1876. He was married first to Anne Honeyman, but after her death in 1844, he married again, to Bella Copeland. In one of J. 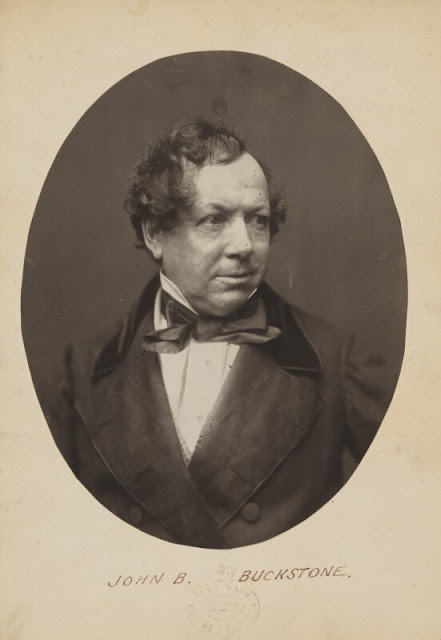 B. Buckstone's obituaries it is stated that he married Fanny Copeland, Isabella's cousin, but although it might have been that they were engaged after Fanny's first husband, actor Edward Fitzwilliam died in 1852, Fanny herself died in 1854, putting pay to all that. Instead, 55 year old Buckstone married the 18 year old Isabella in 1857 and went on to have 12 children between 1857 and 1876. 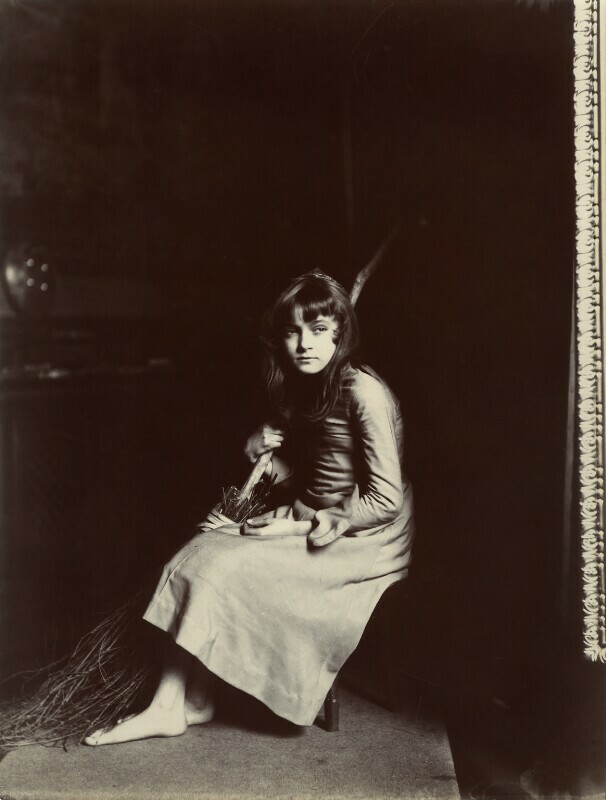 At least three of these children followed their father into the theatre, including John Copeland Buckstone, Lucy Isabella Buckstone, and Beatrice, born in 1869. 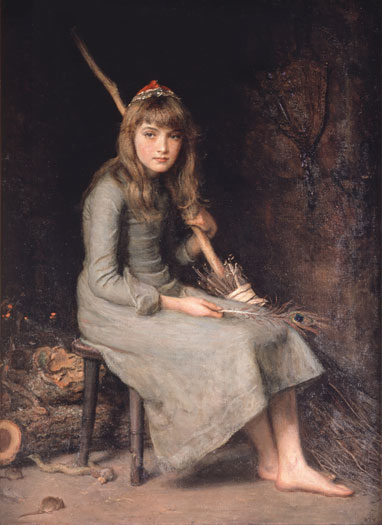 This painting, inspired by the Scottish song about fresh herring (as seen in the creel, or basket). 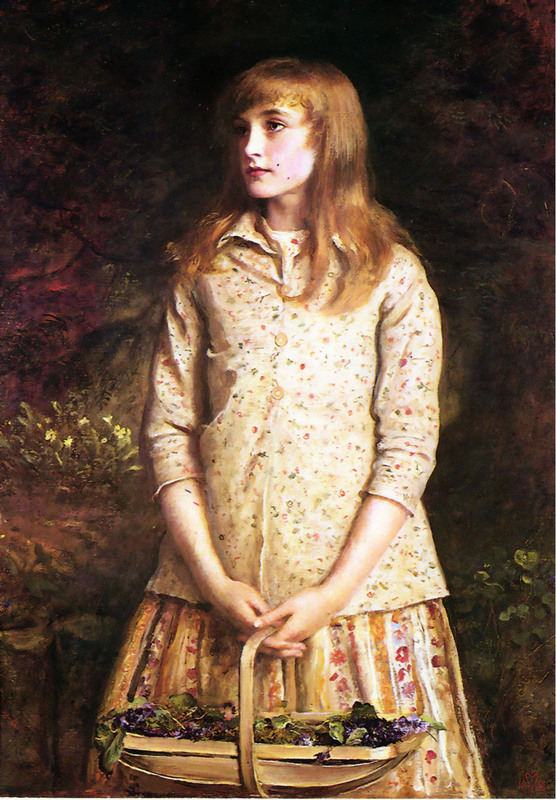 To continue Millais junior's account of Beatrice, after his father had seen Beatrice acting in Good Fortune, her debut on the stage, he wrote to her mother for permission for Beatrice to pose for him: 'This being granted, little Beatrice presently appeared in the studio, when we all agreed that never in our lives had we seen a more lovely child. Her face was simply perfect, both in form and colour, and nothing could be more charming than the contrast between her bright golden hair and those blue-grey Irish eyes that peeped at you from under the shade of the longest black lashes that ever adorned the human face.' Although this is all very florid, you get the impression that Beatrice was a beautiful young lady and even at 12 years old, she was making an impression on stage and off. I wondered if her debut onto the stage was partly due to the family's fall in fortunes. In old age J.B. Buckstone had lost his ability to act and write and in 1878 he was declared bankrupt with substantial debts. A subscription was raised to help the family. It was reported in the newspapers that as Buckstone had done so much to amuse the public, the least they could do was to help him in his time of need. The money was no doubt gratefully received by the family, but in October of the next year, Buckstone died. 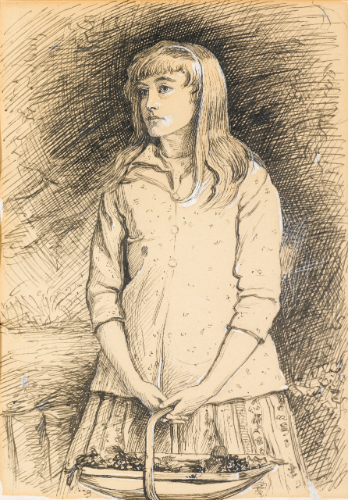 When I saw this as a thumbnail I thought it was just a black-and-white reversed photo of the painting but in fact it was a photo recreation of the painting by Beatrix Potter's father. Here we can see what a lovely young lady Beatrice was, even more so than the paintings. Her face seems so modern and it is such a striking photograph, I was stunned. 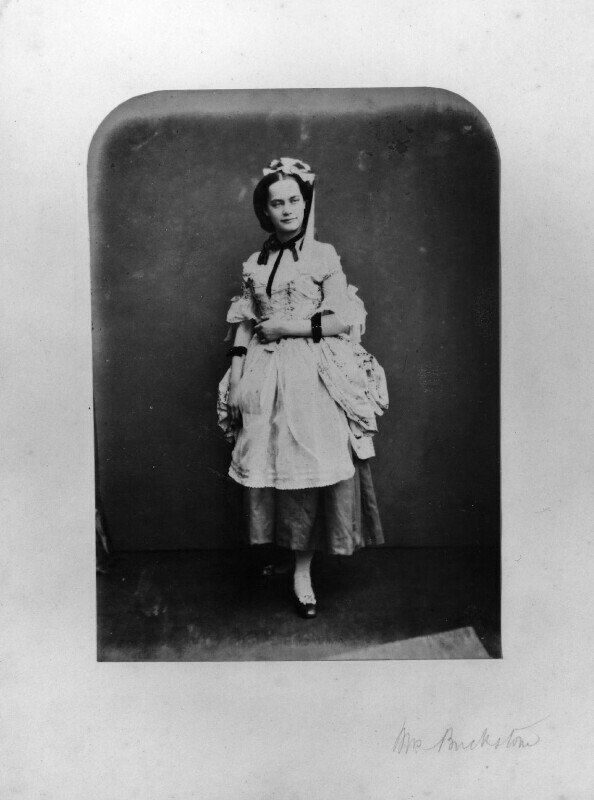 However, Beatrice does not seemed to have made such a splash on stage as her father or acting siblings. After the bankruptcy and death of her husband, Mrs Buckstone went into lodgings in Croyden. The house was owned by Frederick Lawrence and Isabella Buckstone remained there, acting as housekeeper, for the rest of her life. Census returns show her children coming to stay with her so Mr Lawrence can't have minded his housekeeper's family dropping in and out, and possibly, as Isabella stayed so long, it became more like the family home than her employer's residence. Beatrice was still there in 1891, but also staying was Walter Pelham Warren, an artist of the scenic variety. Walter's father had also been involved with the theatre as a playwright so possibly the families knew each other. Beatrice and Walter were married on 20th August 1891 at St John the Evangelist Church, Upper Norwood. However, the marriage was not a happy one. I always feel conflicted when I have to read divorce papers as research because they hold vast amounts of useful and interesting information, but are invariably awful, more so if the woman files them because of the weight of evidence she has to provide. Within two years of their marriage, Walter was unfaithful to Beatrice and gave her gonorrhea. In the divorce documents, Beatrice reports years of verbal and physical abuse, culminating in an attempt to strangle her and throwing her, face first, into a door. He threw her out of the marital home and refused to let her back in leaving her homeless. In 1901 Beatrice was back staying with her mother in Croyden. By 1904, Beatrice alleged Walter was living with his mistress at 525 Holloway Road in London and in 1908 finally filed for divorce. Walter denied all charges. Beatrice was granted her divorce and by the look of the papers, her costs were paid. Beatrice lived to a decent age, dying aged 86 in the Charnwood Nursing Home in Worthing, but rather like the remark in the newspaper about her father's financial hardship, I rather hoped that someone who gave me such pleasure looking at her image would have a happy life, or at least wouldn't be married to someone who was so appalling. Mind you, that is the peril of both life and research, you never know what will happen and not all of it will be good. All you can do is deal with what arises and learn that even the sweetest eyes that were ever seen could have a rough time of it.